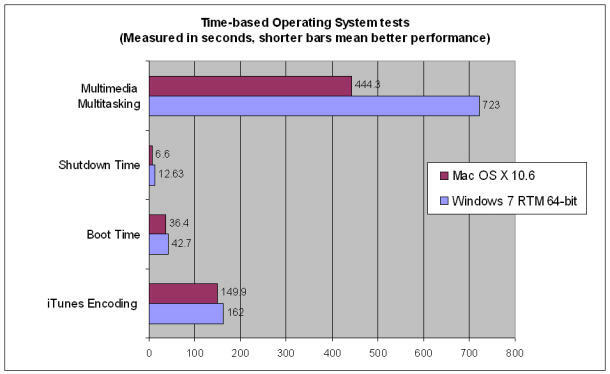 The Operating System wars are still raging, and Mac OS X 10.6 Snow Leopard has bested the new Windows 7 operating system in several speed tests, and a crucial battery life test, according to CNet. Windows 7 did outperform Snow Leopard in some other tests, such as gaming, where Call of Duty 4 had five extra FPS (21fps vs 26fps) in Windows 7, but that’s not too surprising considering that most game developers spend far more time optimizing performance for Windows due to it’s greater gaming market share. If you haven’t upgraded to Snow Leopard yet, you really should. You can upgrade from Tiger (Unofficially) or Leopard flawlessly and you can buy Mac OS X 10.6 Snow Leopard for $25 at Amazon which includes free shipping. It’s well worth the $25. Is Snow Leopard a disappointing upgrade because there isn’t a new GUI? TechCrunch thinks so. You forgot to mention the difference in price. $29 for Snow Leopard upgrade. And you forgot the $200 Apple tax all new Macs come with.